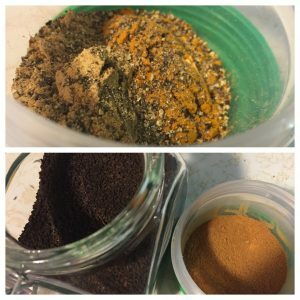 Experimenting with a small batch chai tea spice mix recipe for my morning black tea. No special ingredients—a simple mix with things already in my kitchen. To make the tea: Steep 1/2 Tbsp loose black tea with 1/2 tsp chai mix, in a cloth spice/tea bag, in boiling water. I drink standard Irish or British black tea blends, because let’s face it, they know how to make a good cuppa. Barry’s Gold Blend and PG Tips are favorites.